With just a few weeks left in the basketball season, and with an 8-15 record, Mav fans may begin looking to UNO’s first full fledged season as a Division 1 institution. It’s okay to admit it, we have been looking forward to the 2015-2016 season for quite some time now. Let’s add some more hype to next season by taking a minute to discuss future guard J.T. Gibson. I have stated before that it seems somewhat pointless to talk about recruiting, you do not really know what you have in a player until he is actually in a uniform on the court in a game. But hey, let’s try it. Just looking at a few things, the commitment of Gibson already seems like a win for the Mavericks. The Mavs have wanted to recruit out of the state of Minnesota for a while now, even before transition, it was a great place to go on recruiting trips. With only one division one basketball team in the state of Minnesota, which is a Power 5 team that can recruit nationally, it leaves a lot of room open for “the other guy” to come and try and sell brake pads. That’s a Tommy Boy reference, a poor one, but still a Tommy Boy reference. J.T. 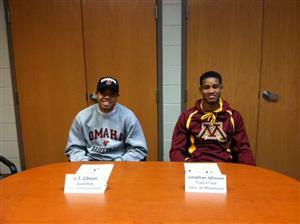 Gibson signed with the University of Nebraska at Omaha for basketball. If you look at Gibson’s Yahoo profile, he held offers from Illinois State, La Salle, North Dakota, Northern Colorado, South Dakota, Western Kentucky, and the top dogs of the Summit League North Dakota State and South Dakota State. He also visited NDSU and SDSU. UNO has not gotten a commitment out of a guy yet that has had that many offers. A goal of the basketball program was to grow into the next North Dakota State and South Dakota State, so to pick up a commitment from a guy that visited those two schools, shows us that UNO picked up a win. Let’s not get crazy though, he still has to get on campus and play. By that I mean, please don’t jinx it and go get in a fight with a Bison or Jackrabbit fan about how we’re better than them now, don’t be that dude. Players have committed to UNO and vanished before, so let’s just appreciate what it’s worth for now. The Minnesota High School Basketball bloggers and writers have referred to UNO picking up JT Gibson as a “steal”. Some of them seem to think he could be at a bigger school, maybe not as an immediate impact like he would be in the Summit League, but an impact for sure at some point down the road. Assuming and praying that Gibson is in uniform next season for UNO, he has the chance to contribute right away. UNO still has room for one more commitment and current players could still potentially transfer out, so there is still time for a lot of things to happen. I have seen Gibson listed anywhere between 6’2″ and 6’4″, and he’s been scouted as being able to play the point guard or shooting guard. So on paper it sounds like we have a special wing player that can do a lot. One thing I would like to put a random disclaimer on. I mention this kid’s height like it is an awesome thing, but height and athletic frame do not automatically equate to success. I never want to refer to a player as “a kid with a great body.” I was watching a Creighton game with some friends one time. It was P’Allen Stinnett’ s first game at Creighton, also the first game for Kaleb Korver and Casey Harriman (among several others). Biggest Douche in the Universe Nominee Travis Justice, that’s a South Park reference, kept referring to Casey Harriman as having a great body to the point that it became creepy. It created four years of my friends and I passing jokes on Casey “the body” Harriman. “The Body” faced many injuries over his career, and he was a classy dude, it was tough to watch him not turn into much at Creighton by his senior year. I do not think we should ever tout someone as a great player because their body looks awesome. The last thing I want to hear Gary Sharp say is “look at the body on Daniel Meyer.” Just say it out loud, it’s seriously creepy. The one take away you should take away from this is that Travis Justice is a freakin’ loser. I met the guy once when I was in high school, I tried to be nice to him because hey, it was Mr. Channel 10. Now I would just be a jerk to him. Hey Travis, I am really sorry you lost out to John Edward. The committee should have really given the award to you. That’s back to the South Park reference. Gibson’s high school team is undefeated (as of the 7th) and he has the most points in school history. He is even up for Mr. Basketball in the state of Minnesota. You are thinking of him on the floor with Tre’Shawn Thurman right now, aren’t you? Gibson also comes from the same AAU team that some guy named Doug McDermott spent time on. It looks as if he can shoot, and shoot well. He also appears to be a good ball handler and passer, but I believe those skills get a little harder to showcase in the next level when you are facing tougher defenses, so we have to obviously wait and see if those skills will translate. Would you compare him to any current and former Mavs? Maybe the height of Justin Simmons, the shooting and ball handling of Marcus Tyus, the speed and penetration of CJ Carter? Mavenstein! Looking at the Mavs future, there will be J.T. Gibson along with (assuming these guys do not leave) Daniel Meyer, Tre’Shawn Thurman, Rylan Murry, and Devin Newsome as well as other signees C Zach Pirog and G Zach Jackson. A decent crew it seems. It certainly does seem attractive to think of those guys as a seniors with J.T. Gibson in the mix as a junior (along with the Zachs). North Dakota State is a young team this year, they only lose Lawrence Alexander, who is the best player in the conference in my opinion. They also have four decent commitments coming in, which includes a JuCo player named Malik Clements who once held a scholarship offer from UNO and they also have native Nebraskan Spencer Eliason, brother of Minnesota Gopher Elliott Eliason. The other head honcho in the conference, South Dakota State, does not have any commitments yet, but they are also a somewhat young team that only loses two players to graduation. South Dakota State could also land a transfer from a bigger school, or a juco player, they just have the power to do that. They also have Nebraskan native Michael Daum, who also held a scholarship offer from UNO at one point, redshirting this season. That’s not to say no one else in the conference has anything else sitting there for future purposes. South Dakota picked up a commitment from Norfolk’s Tyler Hagedorn, another player UNO offered a scholarship. You are also just sitting there thinking that Craig Smith is going to do something. He’s waiting, he’s a sleeping giant that has already made South Dakota better, and will continue to make them better, until he probably gets a bigger and better job. Denver picked up a commitment from a 6’5″ McDonald’s All American nominee (Rylan Murry was also a nominee, just sayin’). On paper, it seems that the Mavs are inching closer to being comparable to North Dakota State and South Dakota State, and Gibson is one of the puzzle pieces to hopefully get us there.